Last year I conducted an analysis of a particular business who’s main focus is procuring, storing and supplying general products to large facilities. The focus of my investigation was primarily around the integration of SAP EDI in to the supply chain and in particular the Procure to Pay (PTP) process with a heavy emphasis on the Advanced Ship Notification and the automation thereof. In the examples I refer to the customer as the party that is purchasing the goods from the Supplier / Vendor for resale. The use of “end customer” will indicate the ultimate customer receiving the product for consumption. How well are you matching supply with demand? How “real” are your supply and demand forecasts? Is your master data and system driving the execution of the process? Are all the tasks in the process being performed in a timely fashion by the correct people? How well are you or your partners performing? Are you improving? Are you addressing issues in a timely fashion? Can you measure success and failure? How are you notifying users of exceptions? How well are your systems working? Are they integrated with each other? Is their one source of truth in your process? Is the process automated as far as possible? How many manual touches are made in your process? Is the solution mobile enabled? Can you access your information while not wired in? 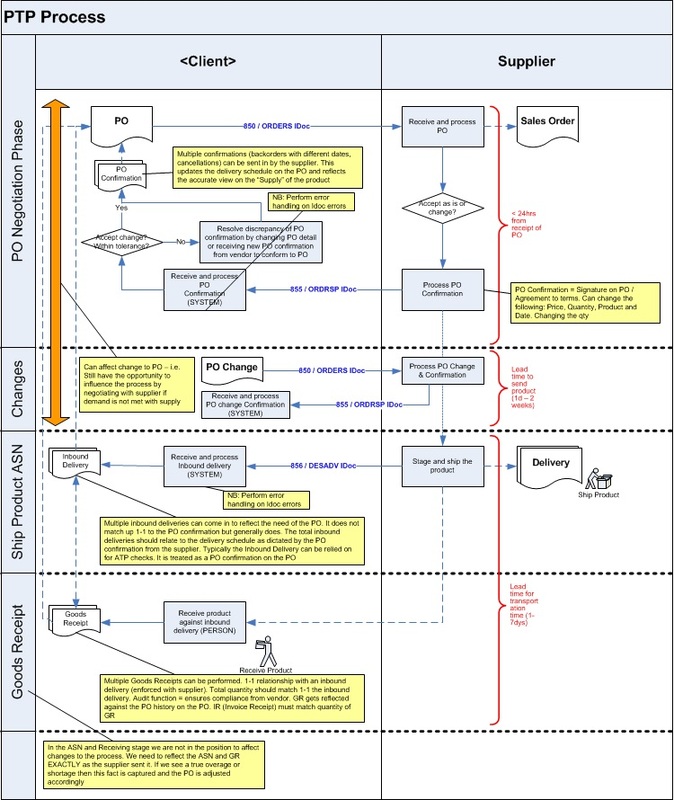 Does the system solution support your business process? Is your organization streamlined to handle the exceptions to the process or are they maintaining the process? Are your people educated in the process? Are the users analytical in focus or custodian in focus? Is change management conducted efficiently in your organization? What goals are we trying to achieve when we strive toward improving the maturity level of our Supply Chain process? Since the Supply Chain is part of the “cost” side of the customer transaction equation the company would benefit financially from a reduction in the cost to execute the Supply Chain. The increased pressure to lower Supply Chain costs should not result in a lowering of service levels to the customer. I.e. improved customer service levels need to be achieved in the process of reducing the Supply Chain costs. The ability to react faster to exceptions in the supply chain in order to catch imbalances in supply and demand. Visibility to the status of the supply chain process to all key stakeholders. I.e. The supplier, customer, carrier, end-customer all get to see what’s happening in the process near to real-time. Why do we need a mature supply chain? Listed below are a few key factors highlighting the desire to improve the end-to-end supply chain process. The following sections highlight each of the components of these 2 areas together with the recommendations for improvement in each. 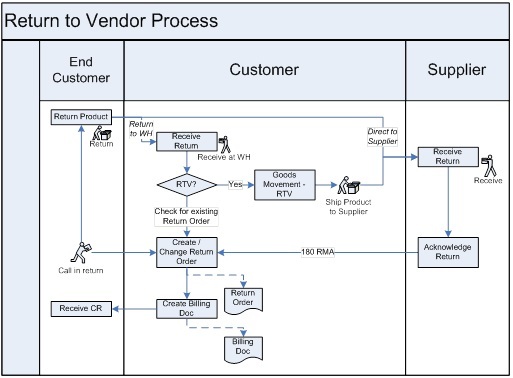 Vendor management is performed by the buyers and includes the process to on-board a Vendor and their related products. It covers the negotiation process, system configuration, pricing and reporting. 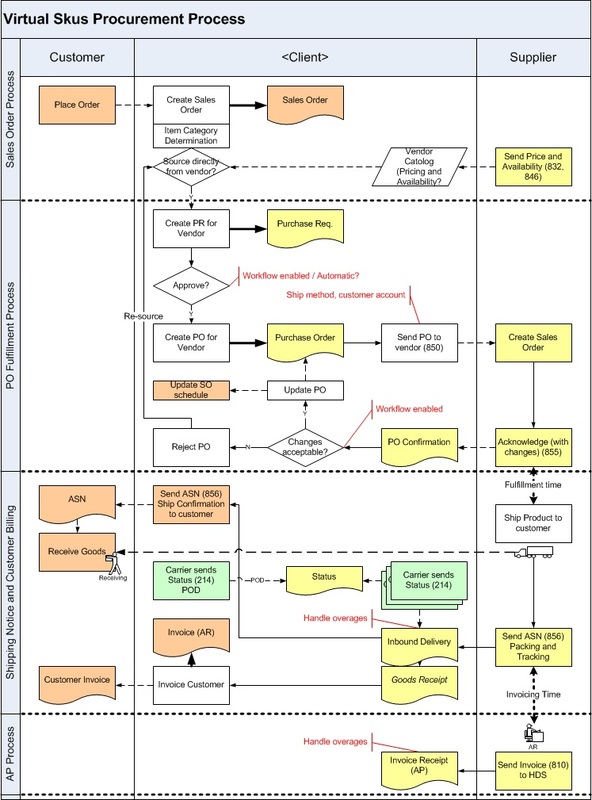 The following process describes the high level activities taken to on-board a new vendor. Values stored in multiple locations. No single source of truth. 2.1.4 What is vendor compliance? The following 3 areas form the basis for determining a vendor’s compliance to the process. A “Perfect Order ” completely fulfills ALL the above stipulations. This section deals mainly with how the customer handles the creation and management of Purchase Orders. 2 key aspects of this process are often forgotten, these being the PO acknowledgment and PO changes. If not handled correctly or if not handled at all potentially leads to a compromised process. On average, how many changes per order are made? There are 2 distinct areas to cover here. One pertains to the PO detail and the second pertains to the response to the PO detail by the Vendor. Similar information is communicated whenever a PO change is made except the change that is needed is highlighted so that the change request can be addressed. Was the PO accepted, rejected or accepted with changes? Similar information is communicated whenever a PO change acknowledgement is made. The purpose of the ASN is to give visibility to the customer for a shipment in advance of its arrival at its destination. All industries utilizing a supply chain process are driving, in some form or other, toward exchanging ASN type information. Customers use the ASN to prepare for the pending shipments arrival. Vendors continue to struggle to adhere to ASN compliance which can be described in the following way. Various pieces of critical information are sent on the ASN. The following advantages are attributed to having the ASN information available to the customer. Less area needed to break down pallets for individual receipt. The majority (59%) of partners believe that a 1% error rate is unacceptable and an additional 38% believe that a 2% error rate is unacceptable. What are the areas that are causing these ASN errors? The following are areas that need to be addressed in order to ensure a mature ASN process. These status messages ensure that the Vendor has in fact actually received and technically verified the Purchase Order or Purchase Order change. Statuses can be monitored for outbound messages to ensure that no errors are received. The invoice receipt is an important part of the process that often highlights issues from earlier on in the process. If you get the process wrong up front then the AP folks are the ones who ultimately end up having to research and resolve the issues. With a mature PTP process in place we can limit these issues up front leading to a more efficient AP Invoice Receipt process. The following data is commonly communication by the Vendor. The customer is responsible for specifying exactly what data is required in order to have an invoice receipt being accepted. Invoice receipt amount and quantity vs.
ASN / GR amount and quantity vs.
Once the supplier ships the product they have a short period (usually 1-2 hrs) to send an ASN (EDI 856) message to the customer. For each shipment an ASN is received. 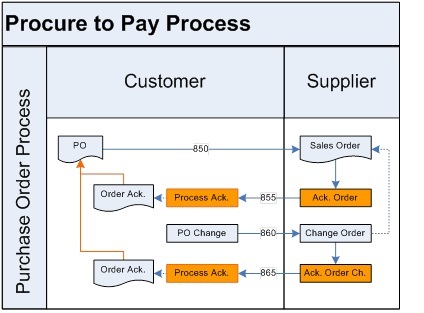 On receipt of the ASN the customer creates an inbound delivery for it against the PO. The inbound delivery is found on the PO confirmation tab of the PO. It contains all the information for the actual product that is on the way including tracking #, items detail, packing info, and carrier detail.